The digital world took a number of very intriguing, if often unforeseen turns in 2013 and more of the same should be expected in the coming 12 months. The only certainty in life is change and we can anticipate plenty more of the expected and unexpected in 2014. So, let’s take a look at some of our predictions. Twitter had a great year in 2013 and the icing on the cake was a very successful IPO that generated a lot of money and even more interest in the site. The platform has always been slightly shadier than Facebook when it’s come to its finances, though the IPO provided a clearer insight. 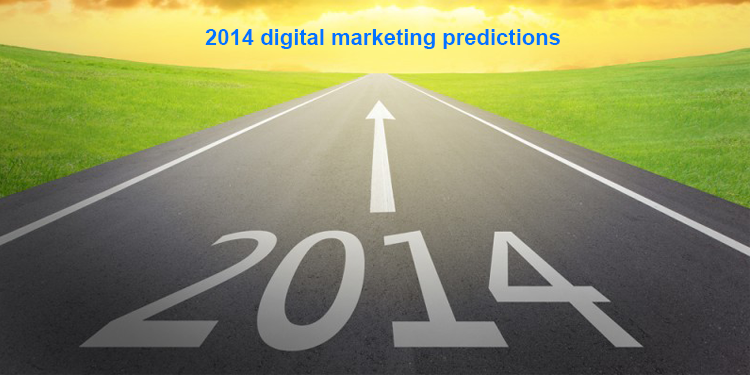 In 2014, anticipate a Facebook like movement and further monetisation of the site. This will include a raft of new pay features, more comprehensive analytics for users and more sites going the same public route on the back of its and Facebook’s rising successes. It won’t just be Twitter that will include deeper data offerings in 2014 either, expect it to be an industry wide prevalence. Measurement and analysis are a marketer’s instruction manual and can be central to the creation of successful marketing campaigns, online and offline. We heard a lot about Big Data in 2013; however expect 2014 to be the year it’s used to its potential. In fact, we’d go as far as making a prediction that many large companies will hire people begin analysing big data information. And, that’s not the only thing. Online advertisement campaigns are also going to be colossal. We expect that both players large and small will put aside huge budgets and large amounts of time to create increasingly creative campaigns that utilise social media, second screen aspects and other digital marketing like never before. Big TV highlights will be a notable area where this will be clear to see, however smaller businesses will also be using social media in less conventional ways. 2014 will mean that it won’t be acceptable for social networking to merely be a status update. To gain exposure brands will need to use video, photo, check-ins and all the other options available. Vine and Instagram may see increased publicity, while text alone won’t just be good enough – it’s a changing world and large and small will need to keep up if they want to succeed. Of course, what more does any marketer want than their content going viral? Viral content is going to be big, but through different means than before. Expect Likes and Shares to come from a true fan base, who will share more bespoke content. The viral aspect that relied on the shock factor will be less of a thing and viral created around a brand’s specific user base increasingly common. One of the driving factors for this more specifically targeted content will be the content aggregation sites. The power of the niche crowd on sites such as Digg, and also Triberr and Influitive will get viral balls rolling. Exposure and influence factors, which tie in with content aggregation, are also going to see an upsurge. Brands are going to increasingly stop measuring success on vanity metrics such as Likes and Shares and the whole concept of free products for social signals will decline as businesses realise vanity metrics don’t actually mean conversions. Expect to see companies increasingly looking for guest posting opportunities on top industry, albeit without no follow backlinks. Guest blogging is going to be increasingly as much about exposure as much as link juice. While, we’re on the topic of SEO, let’s talk about Google+. We say it every year, but this year Google+ is going to be a necessity but as in 2013, not for social alone. Google isn’t going to allow G+ to die on its feet and we say that in its Authorship search engine based moves in 2014. Expect increasing implementation of this service for those looking to push up the search engine results. We’ve seen increasing co-relations between its implementation and SERP success and though correlation doesn’t mean cause, it’s certainly better to be in the G+ club than not. On the SEO front, 2013 was quite a rocky year, but then again they all are. Simply, expect more of the same in 2014. Content is going to be more important than ever, particularly helpful content that provides value. Social media is going to continue to play a central role in success, so focus on strong profiles with high engagement levels through offering content that matters to customers. As we’ve mentioned G+ is going to follow the same vein of importance. One of the biggest shifts is going to come in mobile search. Expect to look back at the end of 2014 and see Hummingbird as the catalyst for notable changes over the next 12 months. Christmas 2013 is the one that will see every man, woman and child receive a smart phone or tablet and Google knows this. Mobile optimisation is a priority for business owners. In addition, expect semantic search and structured data based around the Knowledge Graph to become more important. The proper introduction of voice search with Android KitKat 4.4 also seems to show signals of intent from Google and this ties in with the Knowledge Graph. Expect mobile to be placed centre stage (more-so). So, in a lot of ways it seems like a lot of the seeds for digital marketing and social media, as well as SEO were planted in 2014. In my opinion, the coming twelve months look like they could be more about evolution than revolution. Ask me in December 2014.